These slimline T5 Lightwave Grow lights units are great for propagation, raising your seedlings or cuttings and giving off very little heat they can be positioned as close to your plants as possible to prevent any stretching. They can also be used for additional lighting in a room or tent by hanging the units vertically and placing them next to your plants. A switch is fitted to the unit to switch it on and off, and a 4 metre cable with an IEC connection and plug is supplied, fitting neatly into the unit to supply the power. The reflector disperses the light extremely well for optimal coverage on your plants and the fluorescent tubes can easily be removed and replaced with a simple twist. Hanging loops are also fitted to the units making it easy to connect them to some chain or a set of Easy Roll light hangers. All T5 units are supplied complete with fluorescent blue/cool tubes (6500k) for vegetative growth, we also stock fluorescent red/warm tubes (2700k) for flowering plants available on our grow light accessories page. 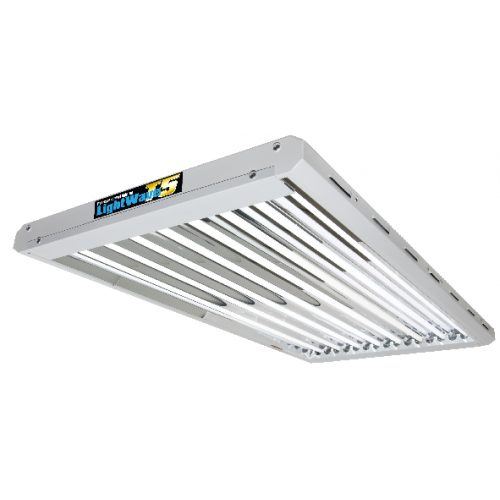 These T5 lighting units are a compact and lightweight design and are also great for using above fish tanks or reptiles.